Darryl Brenzel is a saxophonist, woodwind doubler, composer, arranger and educator living and working in the greater Baltimore/DC area. 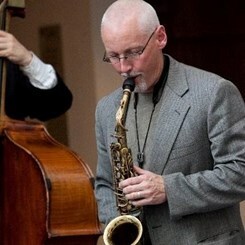 His current musical pursuits include teaching jazz saxophone at Towson University, leading his own jazz trio and quartet, performing as part of the Grammy winning Afrobop Alliance Big Band as well as free-lancing as a woodwind player throughout the region, performing in clubs, concert halls and theater productions. Brenzel retired from the US Army Jazz Ambassadors in 2008. In his 20 years with the band he served as a saxophone soloist, chief composer and arranger and eventually become the band's associate director. With the Jazz Ambassdors he performed at major jazz festivals (Newport, Montreaux, North Sea, et. al.) and with many major orchestras to include The Boston Pops, The National Symphony Orchestra, The Baltimore Symphony, The Cincinnati Pops, The Pittsburgh Pops, The Detroit Symphony Orchestra and The New York Pops. As a free-lance musician Brenzel has performed with numerous names in the industry to include The Beach Boys, Chris Isaak, The Four Tops, The Temptations, The Nelson Riddle Orchestra, The Tommy Dorsey Orchestra, Dan Akroyd, The Drifters, Martha Reeves, Ben E.King, Little Anthony & The Imperials, Eddie Holman, Jerry Butler and many others. Brenzel has arranged for The Dave Liebman Big Band, The Smithsonian Jazz Master Works Orchestra and The Army Jazz Ambassadors. His arrangements and compositions have also been played by numerous college and military bands across the US. Brenzel studied music performance and composition at Berklee College of Music. He was a member of the BMI Jazz Composer Workshop from 2003-05. He has received Individual Artist Awards from the Maryland State Arts Council for both music composition and solo instrumental performance. He is a three time winner in the American Music in the Armed Forces composition competition and is published by University of Northern Colorado Jazz Press. Request Lessons with Darryl today!